Sounds of an electric punji, these melodies and tones dance in foreground. Consciousnesses are transfixed like basket living reptiles with no appendages to press stop. The serenade plays through. L. Valerie with a slightly of kilter moog blitz, some lost track to Kubrick's Clock Work Orange OST. Island hopping to Green I. on a square neck 1930's Regal. Pretty sweet trip. Finishing up with a lunar eclipse, the night oddly gets brighter as L. Valerie shows all of her vocal and musical skills. A short offbeat gem that sounds sehr gut on the big stereo. 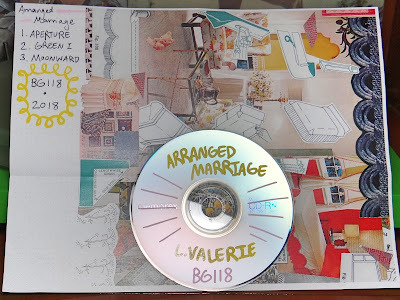 Arranged Marriage is released on Bleeding Gold Records as a digital release. The cd-r in the pictures below is just a artist made copy to get by all of the Lost in a Sea of Sound submission filters, rules and mandates. 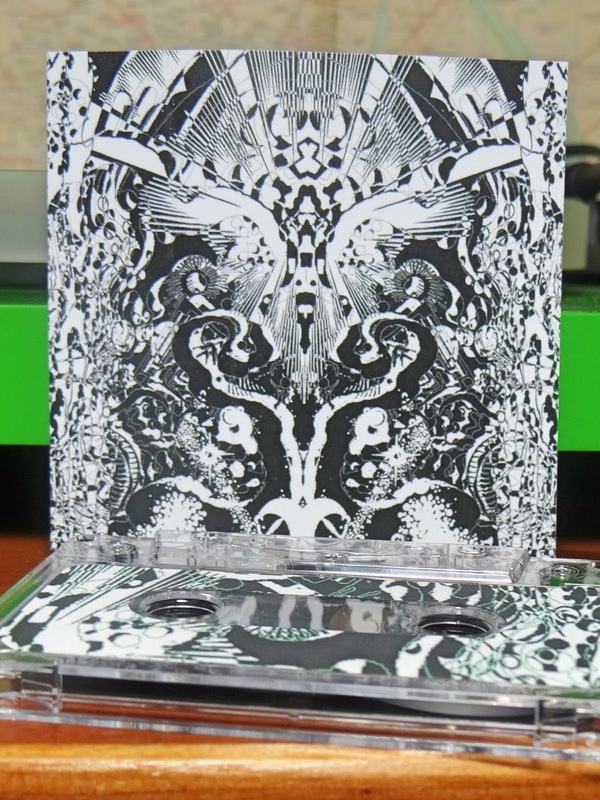 If you would like a physical copy, then set your ears L. Valerie's release titled Frika. 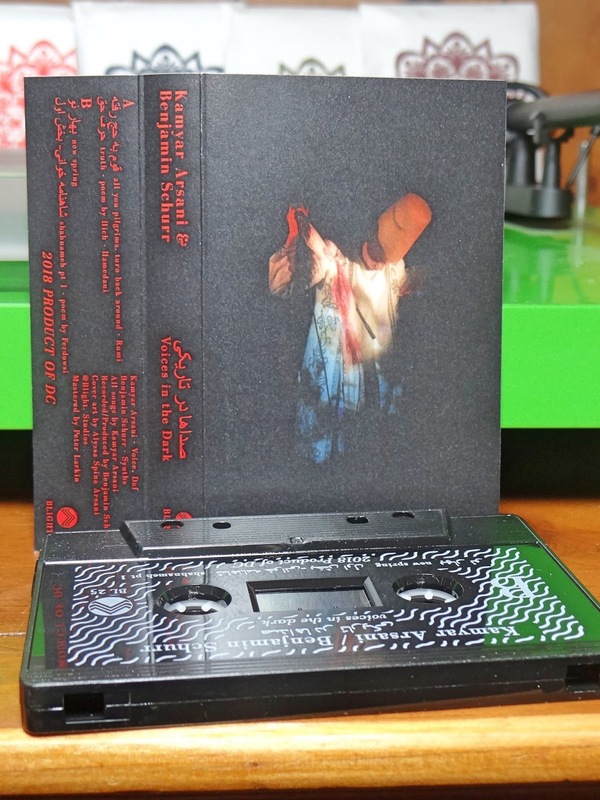 Bleeding Gold Records and L. Valerie combined to produce fifty five hand made editions of those. Mental machinery working in absence of observation. Processes in such grandiose magnitude, most are spared even the consideration of comprehension. Static drone, razor edged beats dulling in the wash of electric pulses, pure energy in a transfusion from consciousness to material from. The sound of Uton in this moment, a force of sonic beauty resting outside tangible markers. A symphony for now, music study for the future. Uton started in Tampere, Finland as a project in 2001. A massive discography across a world of labels, takes rest in Athen's Georgia with the workhorse label \\NULL|ZØNE//. 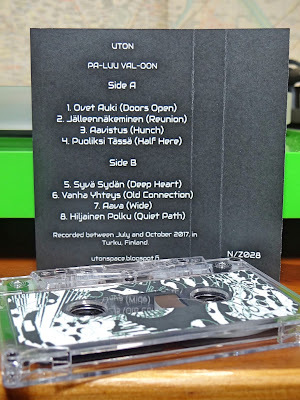 This cassette, titled PA​-​LUU VAL​-​OON, is a lengthy aural glimpse into nearly twenty years of music. 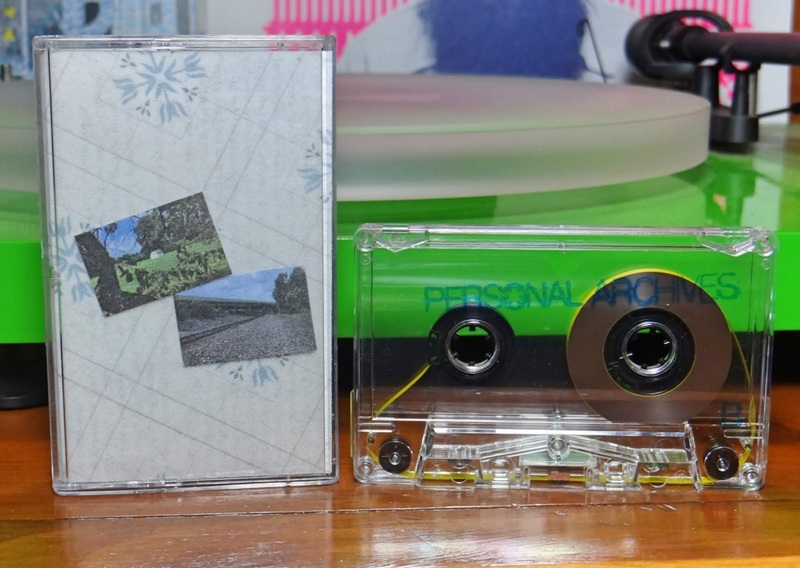 Eight tracks over roughly forty minutes with a undulating sonic gradient. Like a cosmic drill piercing temporal space fabric, layer after layer slowly being worked through. Each track mirroring densities of subsequent dimensions. An unparalleled stamina of tonal patience, always keeping the seal secure. The threshold of all listeners, a degree Uton must constantly take into consideration. A \\NULL|ZØNE// release in the middle of August. Fifty copies on clear cassettes with vibrant artwork by Shifter. 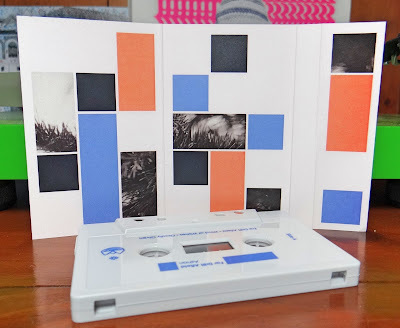 Copies are available from the label's bandcamp page. Sounds for a world beyond the incarnate, captured on tape for those ready to begin the journey. The place where Bob Bucko Junior lets listeners know what music he likes to listen to. Obviously songs that have inspired and influenced directions down musical pathways. 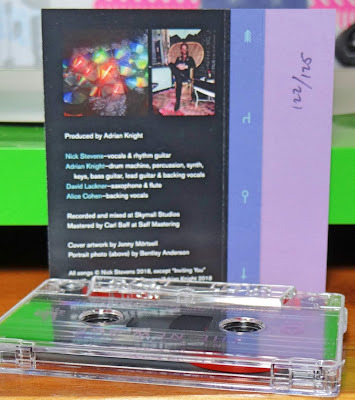 Fifteen cover songs on a double cassette. 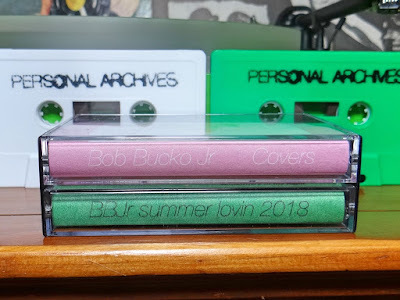 Songs across genres and decades, reworked with BBJr's attention to the true feelings they elicit. Most interesting to think what makes an artist have the realization they would want to cover a song. Did the melodies raise hair on the arms, or was it a long listening relationship culminating in a cover connection? Just like how BBJr brought new takes on a favorite bunch of songs, listeners will cycle through memories and experiences, possibly appreciating these versions with fresh nostalgic love. With this massive assortment, there is sure to be songs never heard before, making the cover the first conscious implant. BBJr's choice of selections from artist's albums that are on the edge of obscurity are intangible. Like Howe Gelb's Love Knows No Borders from the 2006 double lp, "Sno Angel Like You + Sno Angel Winging It". As an avid Giant Sand fan and Howe Gelb solo enthusiast, focus was lost before this album's debut. St. Elmo's Fire from Brian Eno's "Another Green World" 1975 lp and Paradise Is For the Blessed by Television Personalities on the 1989 lp, "Privilege" are two other picks from artist's vast discographies. Take Care by Big Star shows BBJr's deep music knowledge. And then a few more main stream preferences with Talking Heads, This Must Be the Place and Meat Puppets, Up On the Sun. These references only refer to a third of what is waiting on Under Cover Summer. Bob Bucko Junior's versions some times stay in close proximity to the originals, other times leaving only the framework to build new facades. A listen to Under Cover Summer will definitely teach all of us something about music history, old and new talents and how everyone loves something different about music. Available from the Personal Archives bandcamp page. Released in the beginning of August in an edition of twenty five. BLIGHT. Records has taken regulation of the worldly airwaves. The intensity control turned clockwise, crispness and clarity already at BLIGHT peak standards. 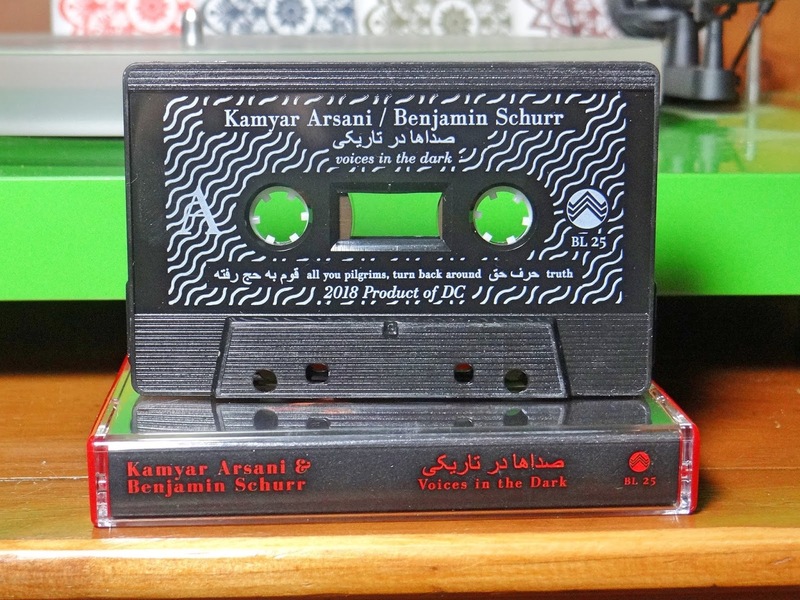 For this edition, Kamyar Arsani & Benjamin Schurr take foundations of folk to modern extremes. Straight forward percussion and vocals from a spiritual core, both emanating from the lightest haze of electronic mist. This is an emotional outpouring, simple and pure strength in talent and creativity. Voices In The Dark contains for tracks across approximately twenty minutes. Kamyar Arsani both sings and plays the daf, a large wooden framed drum with some type of skin membrane, metal ringlets are sometimes attached to the inside of the frame. The drum can played handheld or positioned between the legs and played in a seated position. This instrument dates back roughly one thousand eight hundred years to the Sasanian Empire, also referred to as the Neo-Persian Empire. When listening to Voices In The Dark, the energy and passion are all Kamyar Arsani. Vocals and drum being played on the threshold of time and tradition. 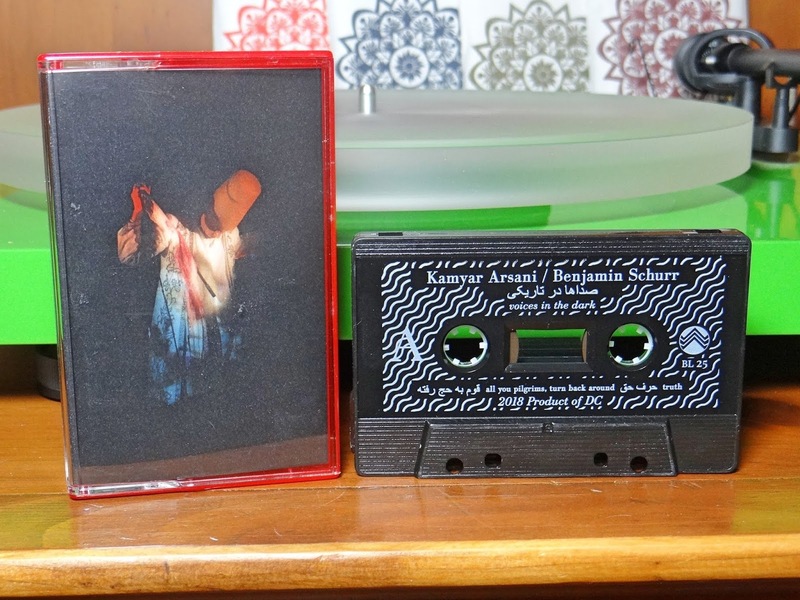 Benjamin Schurr does an excellent job adding droning electronics and producing this composition. 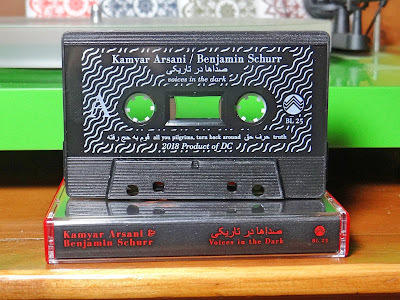 Together, Kamyar and Benjamin, create captivating raw heartfelt euphony. If a comparison needs to be made, think early eighties albums titled Filth and Cop by the Swans. Released on BLIGHT. Records out of Washington D.C. in the middle of July this year. In an edition of ninety nine? Not completely sure, but copies are currently available. 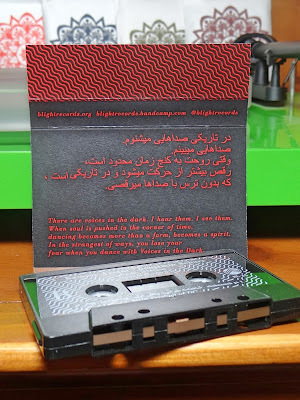 This is the second solo album by Kamyar Arsani, here is the first tilted "No Freedom" from 2015. The wind chime hanging from the rafter of the porch, silent for so long then rustling as the atmosphere tries to equalize. Stillness upset by currents moving through. Delicate clatter waiting for energy, the life giving force. Nature making a wish, asking for attention, seeking thoughts from those who dwell within it. Many are oblivious, air conditioned or heated climates closing off elemental forces. Windows becoming giant screens to see a living physical world. Kenji Kihara has ventured past the walls, protective glass left behind. He channels the ebb and flow of natural spirit, making the timeless chime sing it's song. Reaching deep, past protective fibers, this music is both heart and breath of a world slowly being left behind. Scenes of Scapes is a summer cassette release on the Inner Islands label. 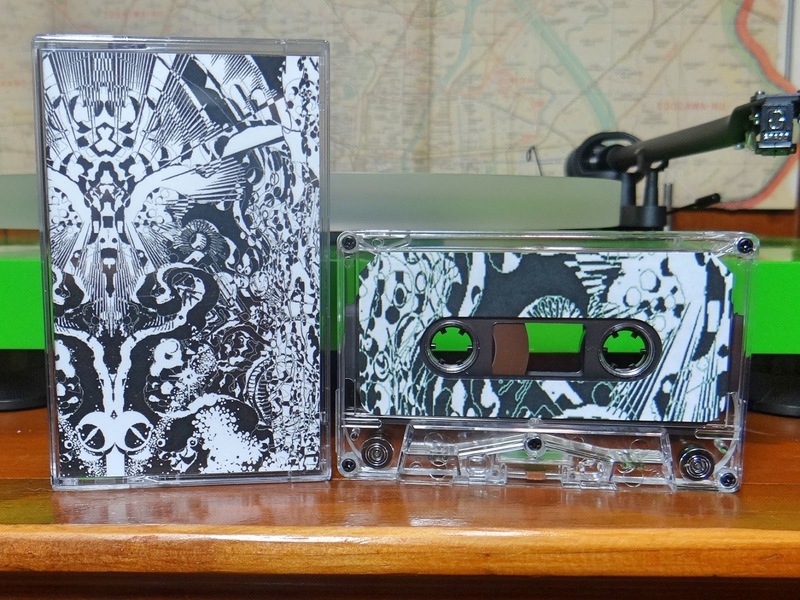 This is a mammoth composition with seven tracks spaced over forty five minutes. 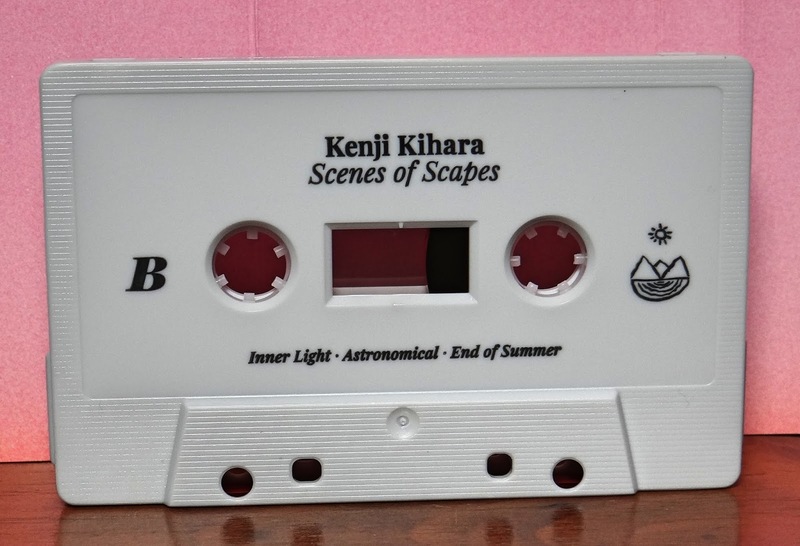 Kenji Kihara tackles the ambient beauty set forth decades ago. Scenes of Scapes is easily a continued segment of the sonic continuum set forth by artists like Dirk Serries, Robert Rich, Stefano Musso and Steve Roach, to name a few. Many of the past ambient compositions seemed to have a very light ominous dew. Maybe this evoked a hidden power or pushed consciousnesses to new thoughts. Kenji Kihara has veered away from this tone. His sounds are most close to chimes pushed by a massive molecular flow. There is no undertone or ulterior thought plan. Turning away from dark cave entrances, this composition pushes aloft. 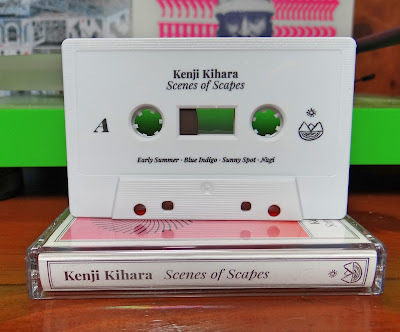 Using talent, experience and creativity Kenji Kihara is the gentle breeze uniting the spirit we all share. An end of July cassette release on the Inner Islands label. In an edition of one hundred with copies currently available. 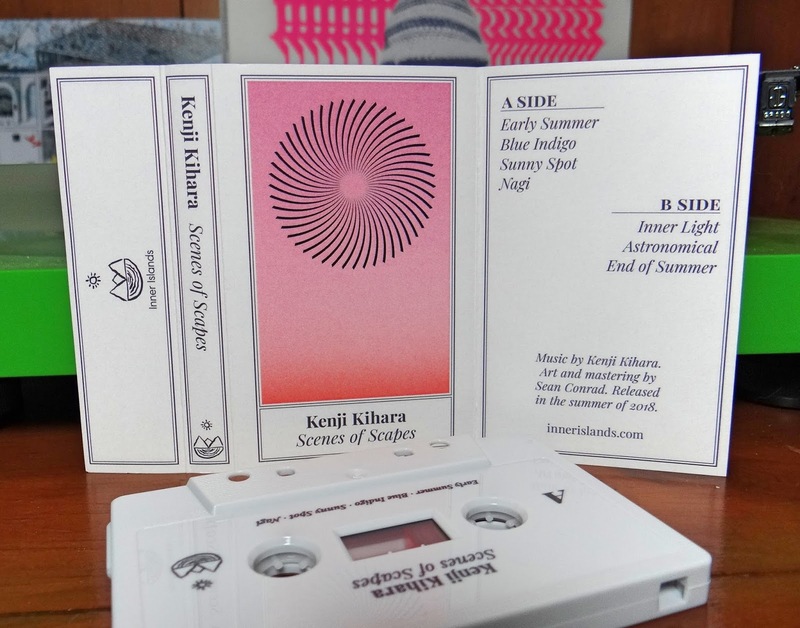 Kenji has a couple compact discs available through the Sunshine To You shop and more to explore on his bandcamp page. Scenes of Scapes could be the first physical release in the States thanks to Inner Islands. A reincarnation of African sounds. The path following struggle and hardships, crossing oceans only to be worked for generations. Creativity always present, developing with emotions congruent with the times. The sorrow and freedom of expression combining to be called the blues. But the roots go way back, to a continent where Michael Potter must have experienced past lives. His sound has the rhythm, tones passed from old to young, beauty built around a lasting connectivity. 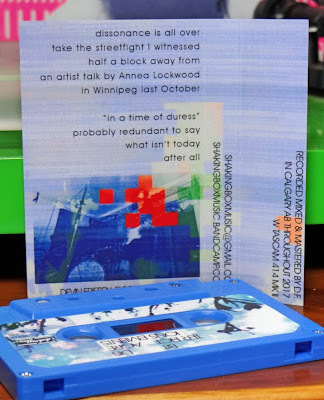 There is so much to hear on this Tour Tape. The sounds are on the most perfect edge of acoustic and electric. A balance sustained for roughly twenty five minutes over three tracks. Sonic sweetness dusted with powdery effects Michael Potter has dialed in. Origins are difficult to pinpoint, with tones reaching across continents and spanning lengths of time. As mentioned above, Africa would be a good place to start, then following the path through early American blues. Making a comparison to the early electric works of Lightning Hopkins is where this is headed. Both with beautifully raw electric guitar sounds, heavy in emotion and experience. Listen to the last track on Tour Tape titled "A Good Bad Time" then check out this track from the past. Yeah it is a stretch, but got to use any chance to compare great modern guitar playing with some of the best from the past, especially blues! Not going to go into the other side tracks except one... The co-founder of Takoma Records, Eugene “ED” Denson, came up with the term "American Primitive" to describe someones music. Michael Potter might be the modern "American Primitive". Excellent live recordings and well worth the time to listen. 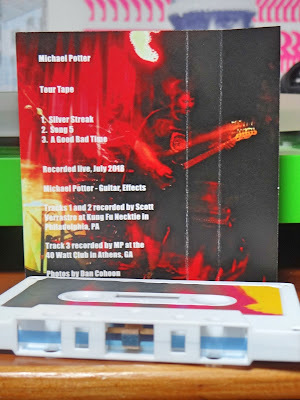 Copies are available on Michael Potter's bandcamp page. In an edition of sixty and released in the later part of July. 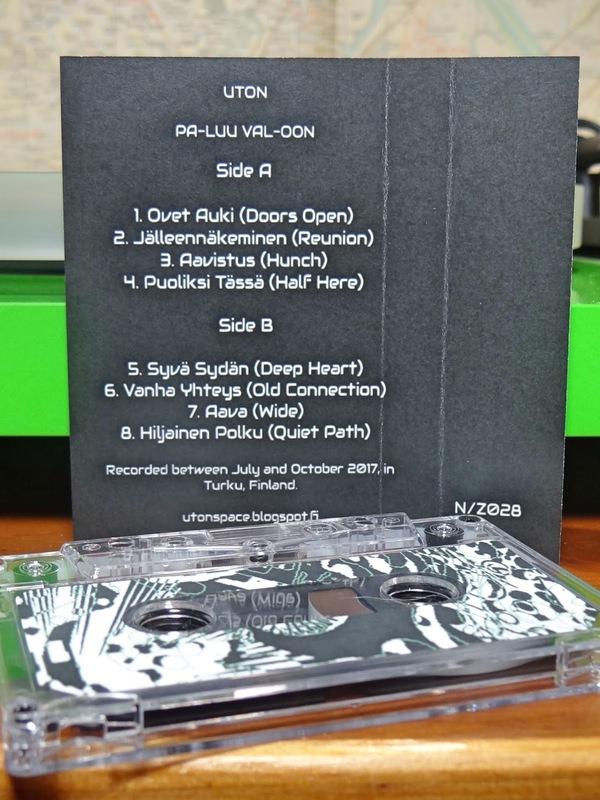 Tour Tape is not up on the label Michael procures, \\NULL|ZØNE//, so don't get lost when you are ready to bring this cassette home. The vast magnitude compromising a swell of sounds, an immensity difficult to fully comprehend. Consciousnesses like tiny ships on the ocean, rising up from the trough. Fortunately these sounds push past the crests, physical amplitudes left as spiritual journeys begin. Thoughts become baggage, like arms full of supplies. They are dropped and decidedly deemed unneeded. Space opens up, as corporeal existence is relegated. How can sounds be the key? 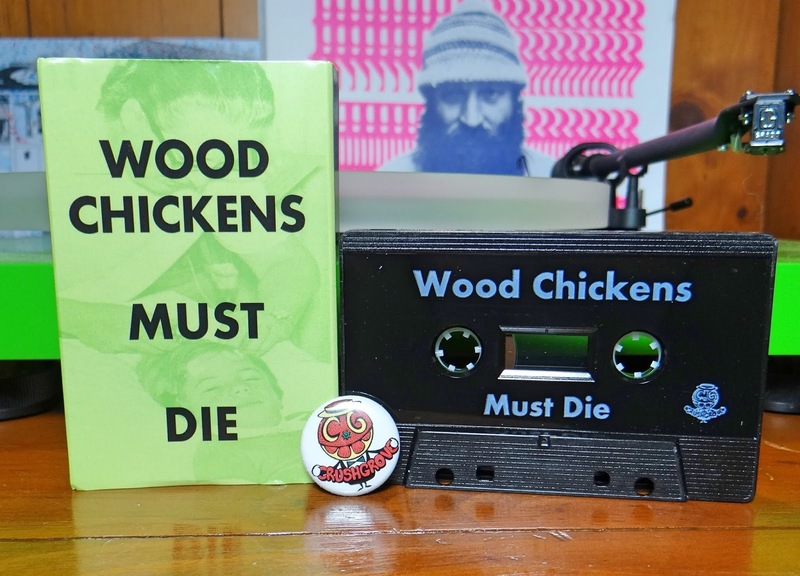 Matthew Crook and Fitz Hartwig help answer this question. 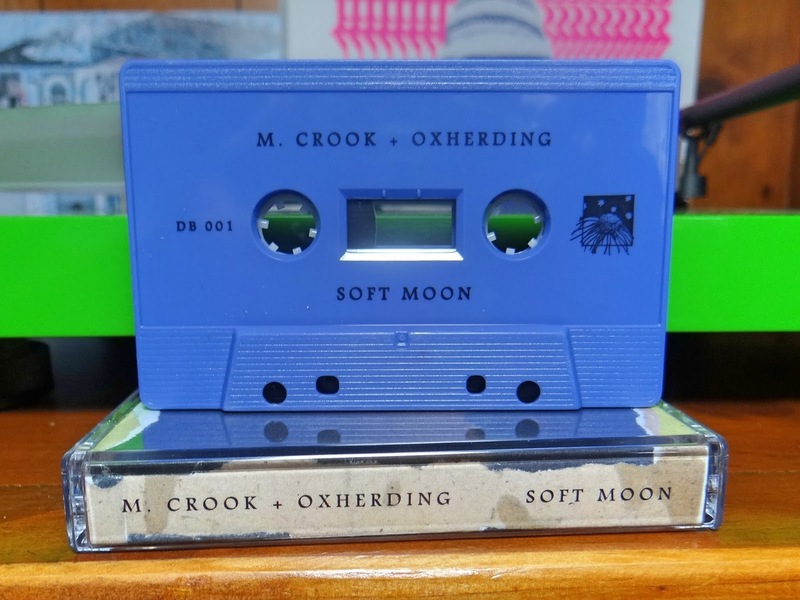 Soft Moon has two parts, perfectly balanced. Two gorgeous ambient drone pieces, touching the jet stream of higher vibrating energy. Both tracks are built and then rebuilt. Matthew and Oxherding (Fitz) working together. So not a split tape, a collaboration instead. Their sounds press on the tranquilizing points of bodily vertebrae. Like someone digging their thumbs into points between the shoulder blades and lower neck. Pressing and holding, tension releasing as the mind kicks it's shoes off. Maybe cooking sonic recipes together helps find the most perfect combination. Certainly two like minded artists would want to impart their love for music in a way the other understood. Listeners are favoured by just floating on the surface as their creative sea expands in the celestial direction. 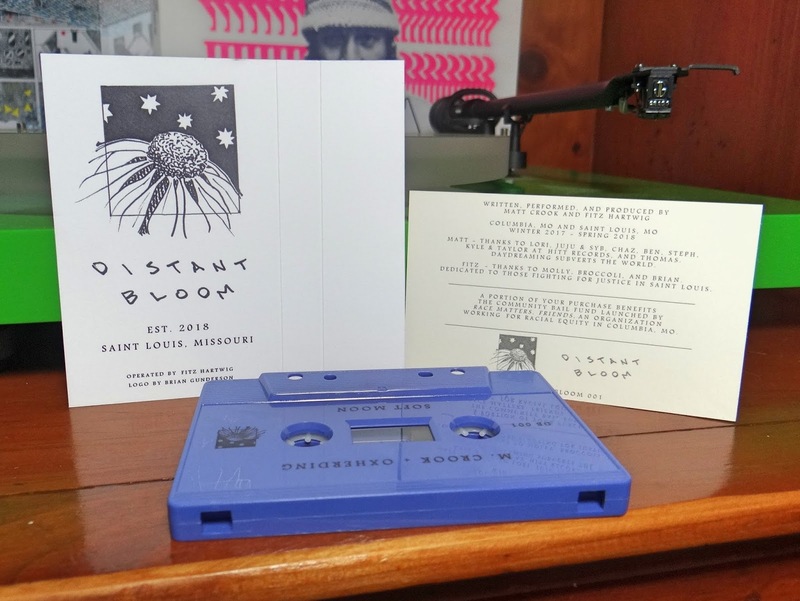 Very happy to have listened and hopefully connected with the first tape from a new St. Louis, Missouri label called Distant Bloom. 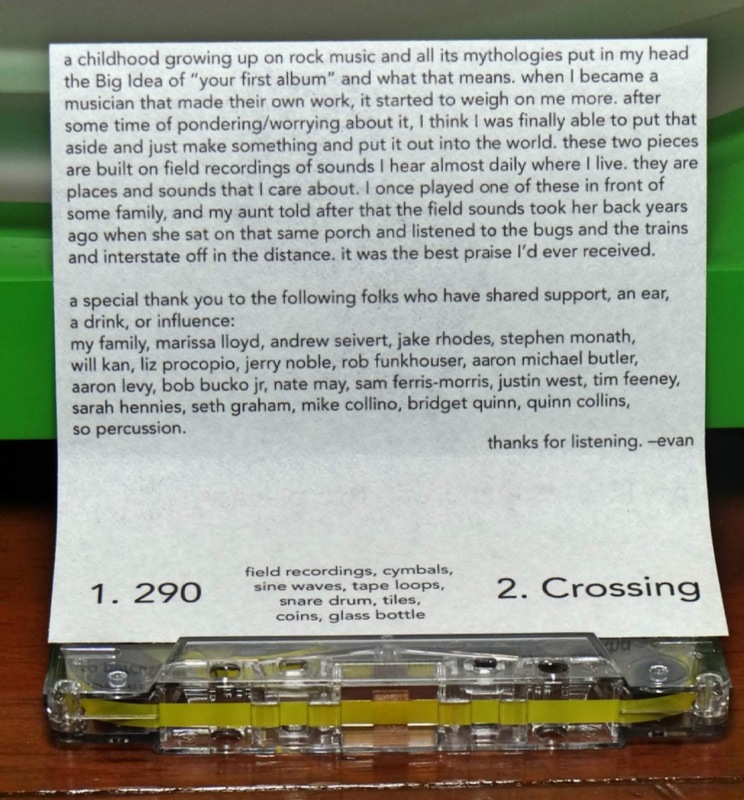 Portions of all tape proceeds will go to organizations of each artist's choice. 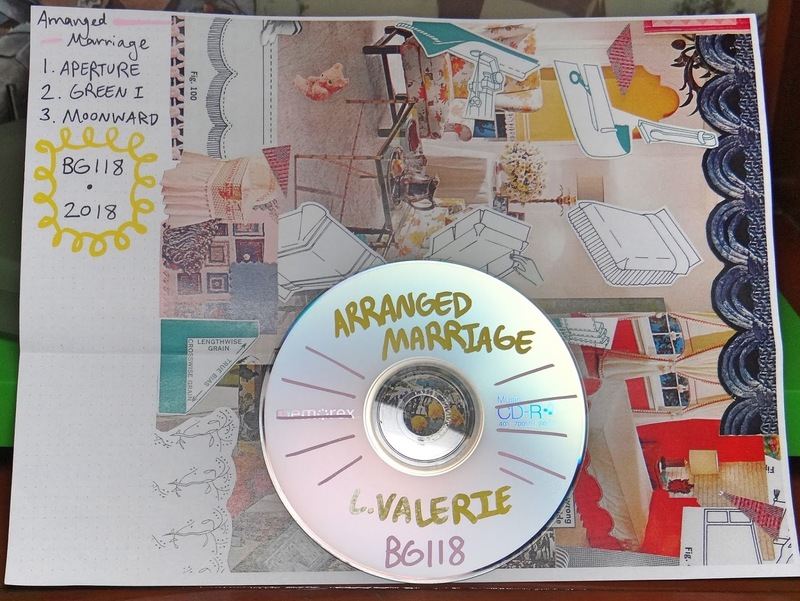 You can get on a mailing list by request to the label. 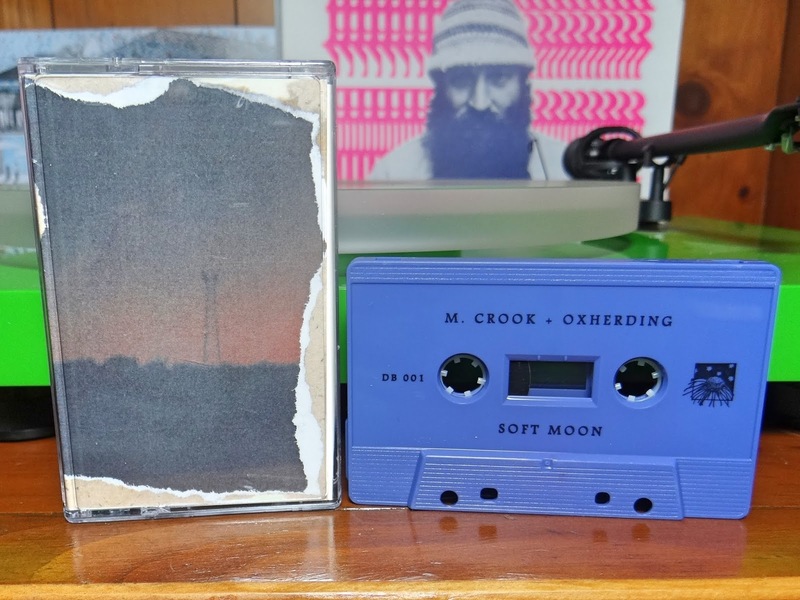 Soft Moon is the first release and is in an edition of fifty with copies currently available. There are many connections with both of these artists to great people and music, especially from the Missouri area. 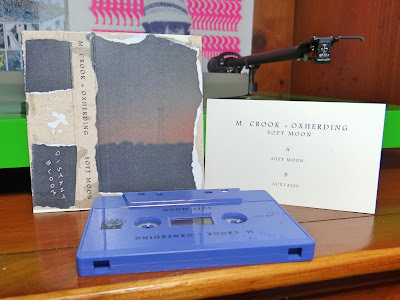 Please do not hesitate in ordering a copy of Soft Moon, it is absolutely a beautiful composition and will be gone with a gain in momentum. Nick Stevens.... you have been eluding description. Listening for weeks now and there you stand. Like a deer, ahead on the trail, both seen and seeing back. Getting close and through the woods you go. The New Age feels like it is from ages ago. A subdued and surreal journey meant for the super chill, the after party with location only known to the few. Thank you for the invitation, although still mildly out of place, the repeated listens have opened thoughts to a sonic landscape evading whereabouts. 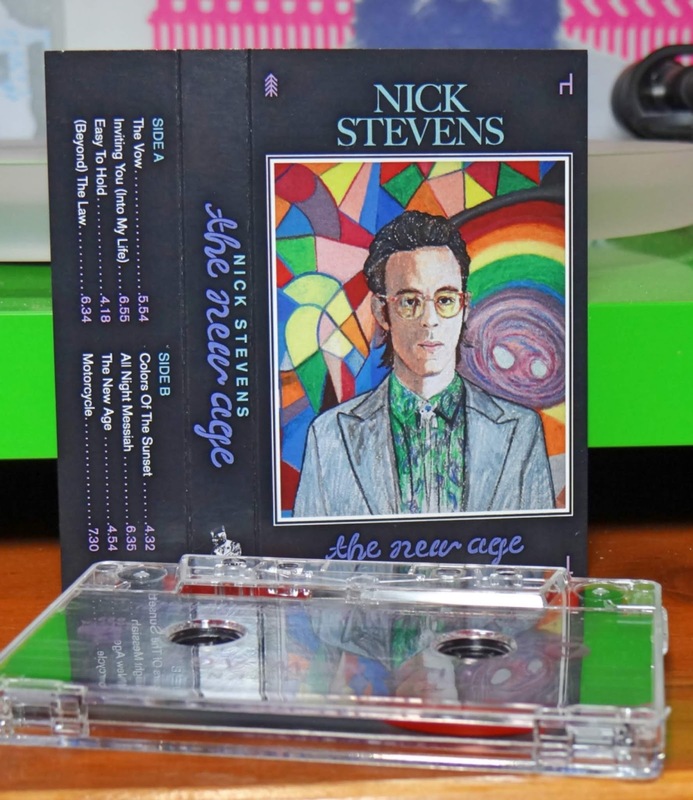 The New Age takes time to infuse smooth rhythms and clever vocals. A composure definitely attributed to the skilled writing and experienced musicians behind these tunes. The most pertinent question after the first play through, how did you get here? The path back, filled with influences and comparisons, seems so apparent, but vanishes when any thought is applied. Hints of new wave music resonate with some accord, briefly heard like seeing smoke from fireworks in the night. 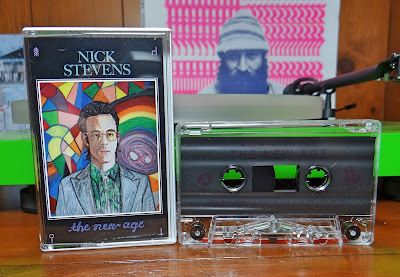 Like the Cat from Red Dwarf, evolving from feline to human over millions of years, Nick Stevens has been cloistered in a Holiday Inn lounge, writing and playing for unimaginable lengths of time. This cassette contains eight long tracks that are anything but protracted. These patient melodies sprout, bud and blossom in the thoughts of all who listen. 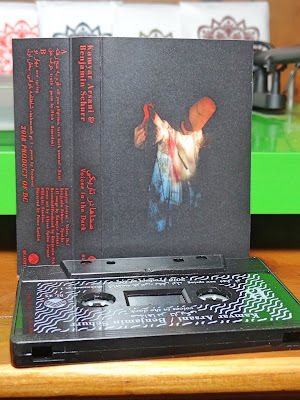 Amalgamations of sounds, perfectly proportioned, creating superlative sonic smoothness. 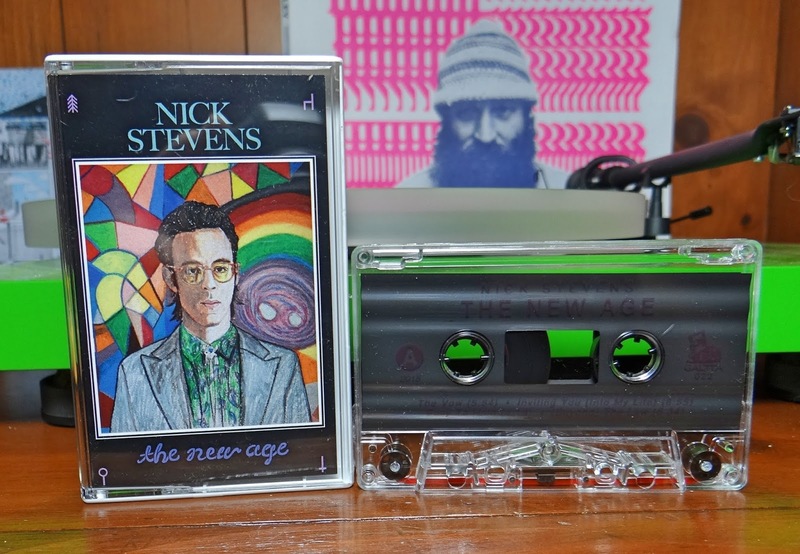 Handing this cassette over to the music scholars, the only way to escape the Nick Stevens temporal loop. Released on the label GALTTA, from Brooklyn, New York. 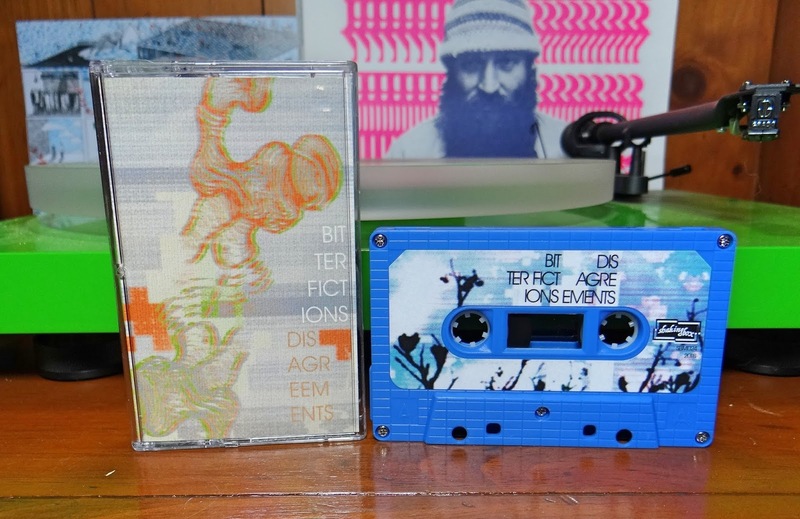 Cassette editions in a run of one hundred and twenty five. 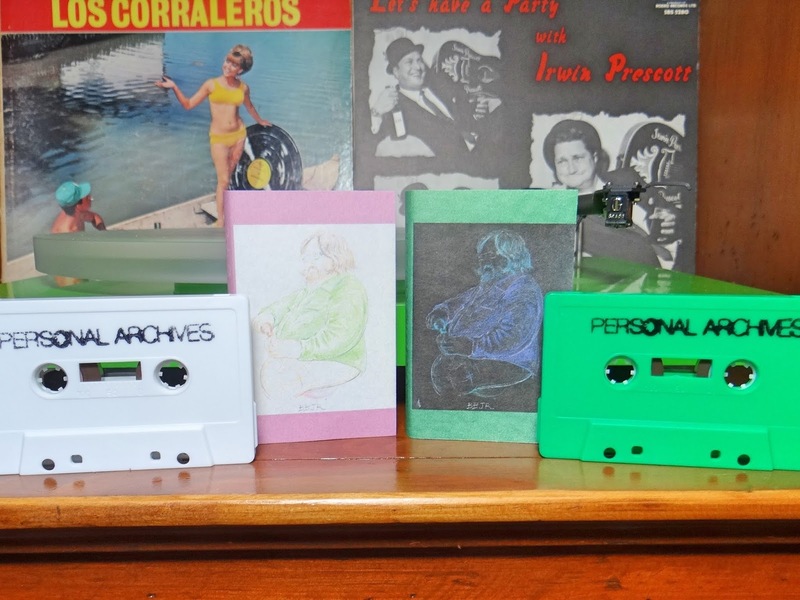 Copies are currently available from the label's bandcamp page. 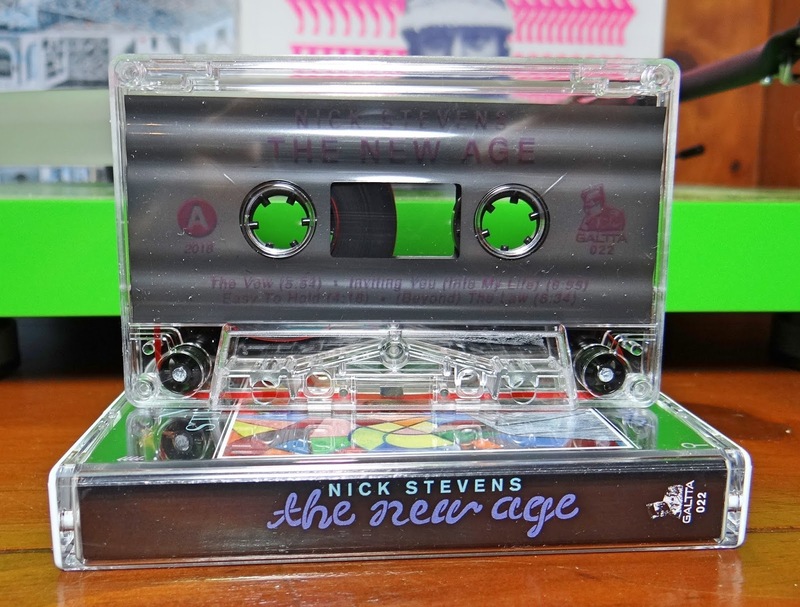 The New Age is an excellent composition and only asks for predispositions to be left on the mat before entry. 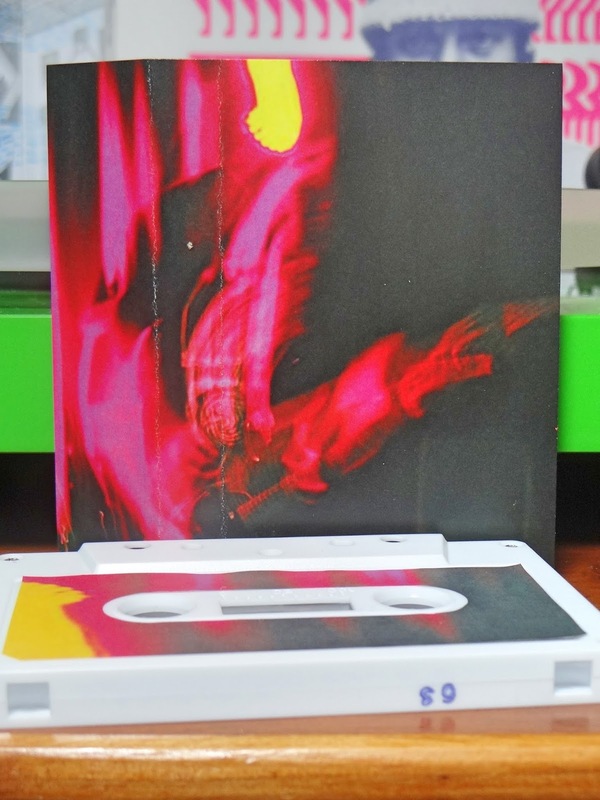 A cassette single or a really compact blast of sound. Wood Chickens from Madison, Wisconsin dial up four micro tracks of half pipe rhythms. 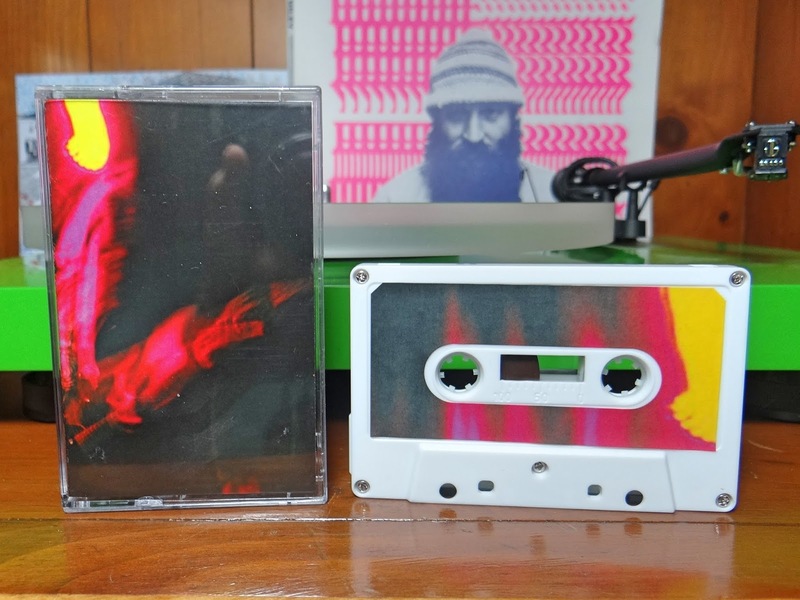 These songs combine sonic playfulness with the power of a jet engine at take off. Other than the opening DSL connection to the internet, it would be hard to discern Must Die's temporal origins. Easily interpreted as punk music from the late seventies. Both vocal and instrument power like Fear, and waggish transitions similar to JFA. 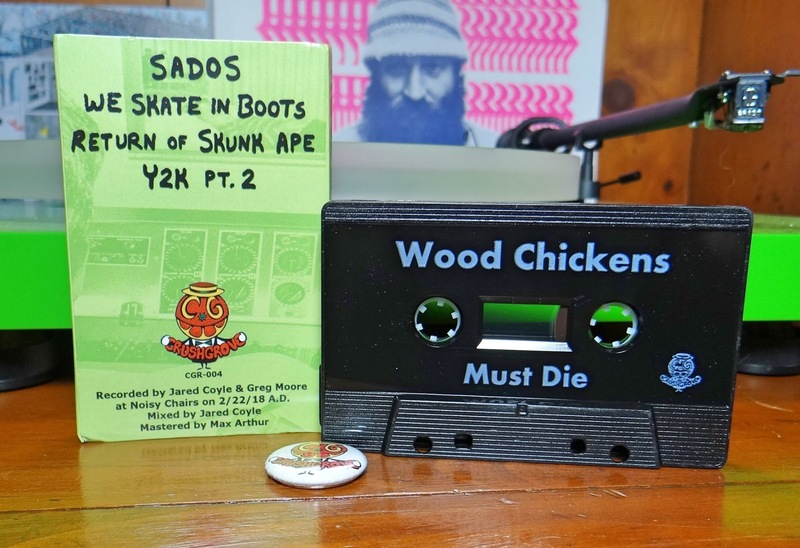 "We Skate in Boots", is an excellent example of Wood Chicken's respect for the music they love. 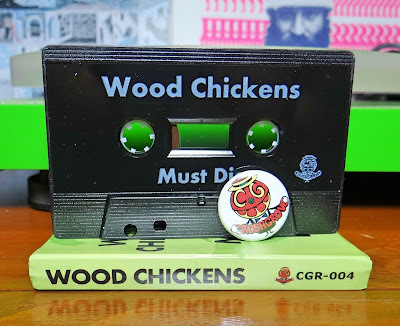 Be sure to take a look at all of the upcoming shows for Wood Chickens, seeing and hearing them live would be a very worthy experience. Just released on Crush Grove Records at the end of July. Copies are available from the label's bandcamp page, not sure how many there are though. 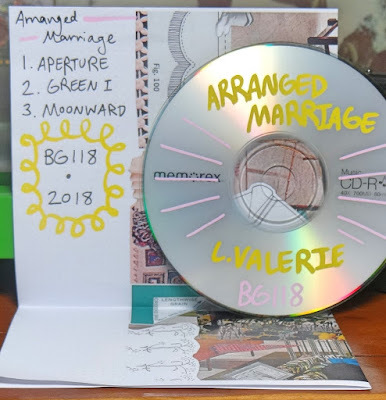 Looking at the band's discography, they have had vinyl, cassettes and compact disc over the course of almost four years. 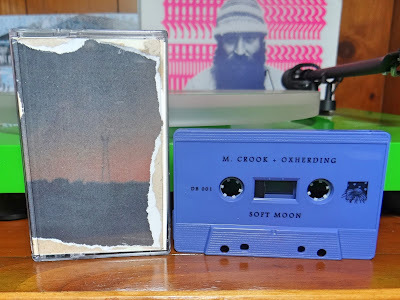 Everything is sold out except for one cassette and now, this new cassette on Crush Grove Records. If you are checking the label, be sure to listen to KP & Me, Lost in a Sea of Sound described this a year ago. In the distance, sounds originate and travel across feet or sometimes miles. Clear and bright or muffled from integrity loss, all arriving at conscious focal points together. Without plans or reasons, the landscape combines everything, throwing together a symphony with each artist playing on their own accord. These combinations are unique and specific to the environment they commence from. Evan Miller has captured Two Places he holds with bright spirit. A droning hue of a world, an aural breath from surface commotion, nature and man's life together. 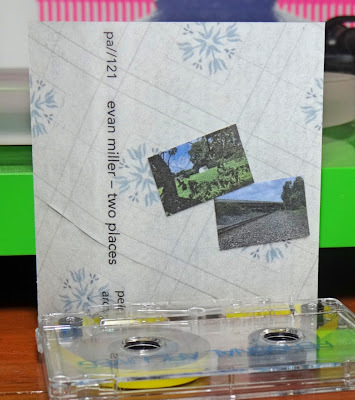 Two Places is two side long tracks, field recordings that wobble with surface velocity. Evan has perfected a duality in representing each venue. The nuances of recognizable sounds flicker with firefly frequency. Insects, storms and wind, ancient rhythms compared to the current clatter of human presence. Evan's creative energy molding and shaping what is natural, like moist clay being fired and a rich dark glaze being applied. What was once unrefined is now fashioned with a spiritual connection. An augmentation of nostalgia, but with feelings that are difficult to comprehend. This is simply called love and Evan Miller imparts these emotions on all who care to listen. 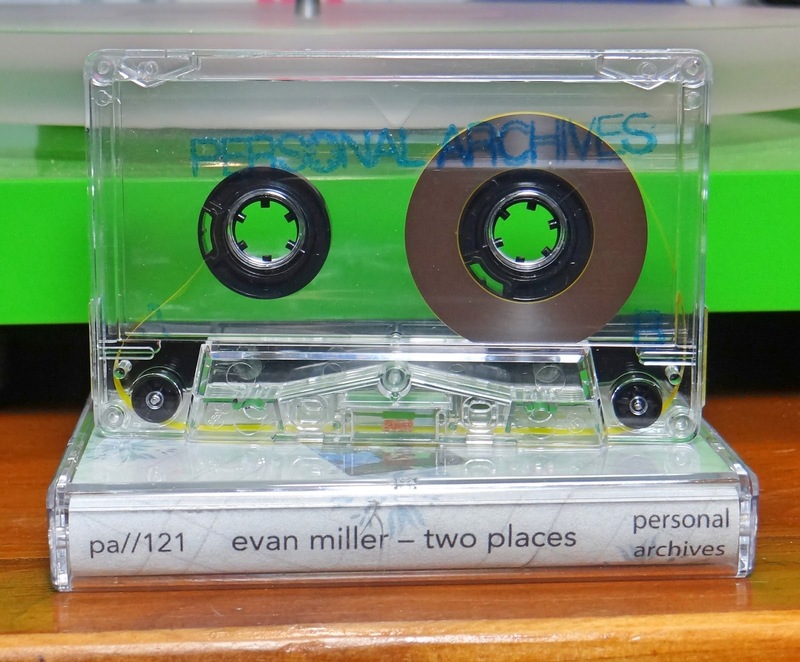 Released on the Personal Archives label in July of this year. 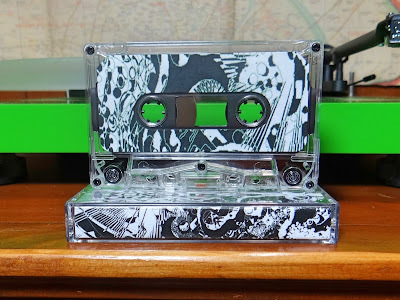 These cassettes were done on clear shells, yellow leaders and some really nice hand woven paper. In an edition of forty. 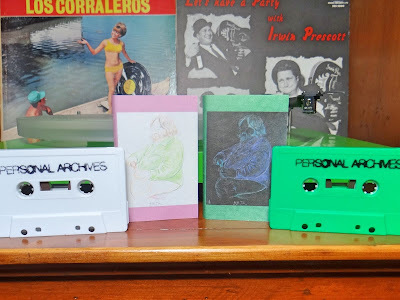 Copies are available from the Personal Archives bandcamp page. 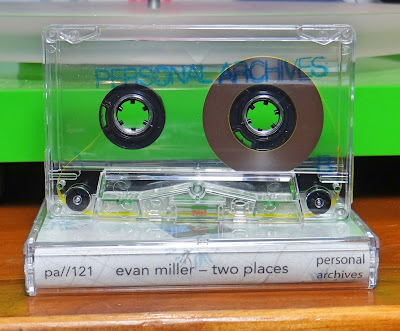 Evan Miller is a sonic heavy, thanks Personal Archives for getting this on cassette and for all to experience! A sonic time lapse of hectic streets redlining above maximum efficiency. Pavement beings to heat then boil, buckling beneath the cacophonous din. This urban world is swallowed leaving fractured pavement, open holes and an eeriness for the future explorers. Blades of weeds permeate withering asphalt and life begins again. The new gentleness arrives in angular notes, the majesty of before somehow causing an echoing reverberation in the lengths of broken avenues. Are there human beings left? Most likely not, just bones being kicked and rumbled by replacement life. Future unfamiliar, what will be is not currently understood. This is the sound of Disagreements, this is the beat yet to come. 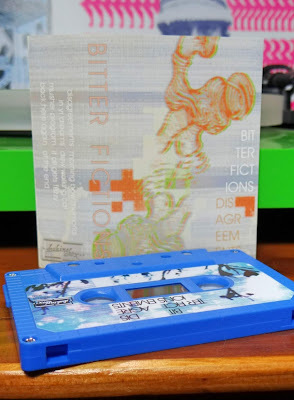 Bitter Fictions is the project of Devin Friesen, prolific sound maker and label head for Shaking Box Music. 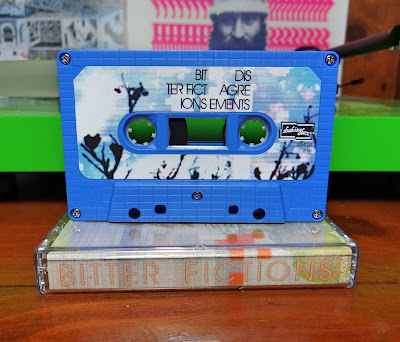 On this newest cassette titled Disagreements, D.F. wavers between both industrial collapse and a quiet world ready to take its place. 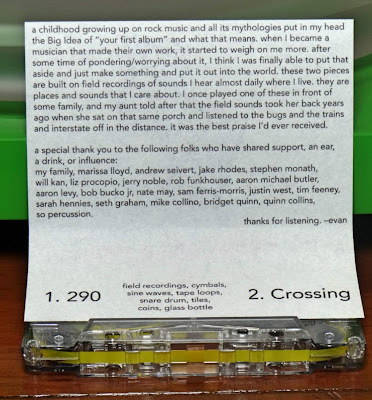 Seven tracks divided in just under forty minutes of length. Straight lines of pure sound so long and old, sweet melodies still striving to be heard as deterioration frays all surfaces. Bitter Fictions focuses on these crumbling edges. Like Hagi Yaki pottery from Japan, these tracks are finished with a beautiful glaze over pot marked surfaces. This sound crazing effect, either something sought after by D.F. or just has developed over long periods of time. Beauty in the balance of serenity and distortion. Difficult to achieve symmetry from both aural fields without obviously trying to hard. Bitter Fictions seems to have a natural perch on this craggy pinnacle. As noted above, Disagreements is released a few weeks ago on the Shaking Box Music label from Calgary. In an edition of sixty five, copies are currently available from the label's bandcamp page. 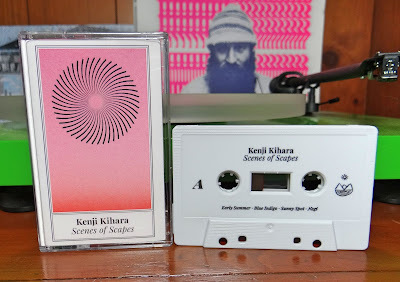 A gentle cascade of sounds, tributaries to a sonic world that rest below the perceivable gradient. Patient tones meandering through ancient erosion, individualized purpose gathering the most subtle momentum with adjacent notes. A melody is formed by compacting sound waves, obstacles only strengthen the flow. The aural field opens up, allowing thought to take part in the peaceful pool. Here the notes elongate and begin to lift, their sheer forms gaining flight from mixing mediums. Consciousness has been given a great gift, a companion that only bestows beauty. 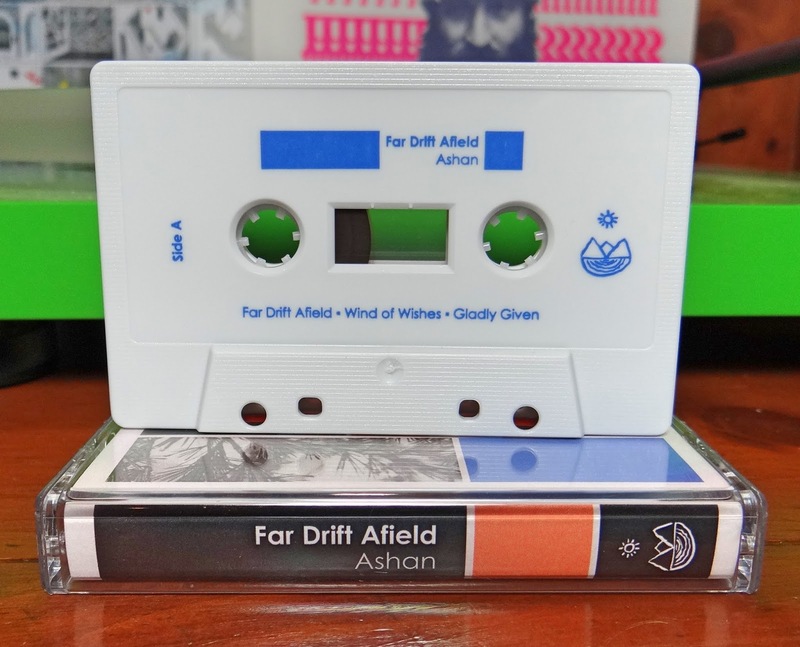 Far Drift Afield contains five harmonious tracks divided in over forty minutes of length. 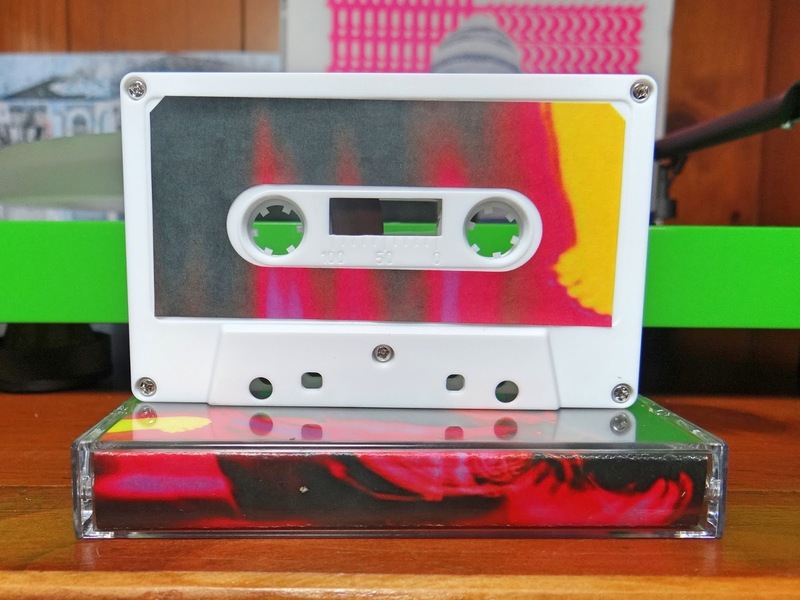 Each side of the cassette seems to achieve buoyancy then settle and rest. 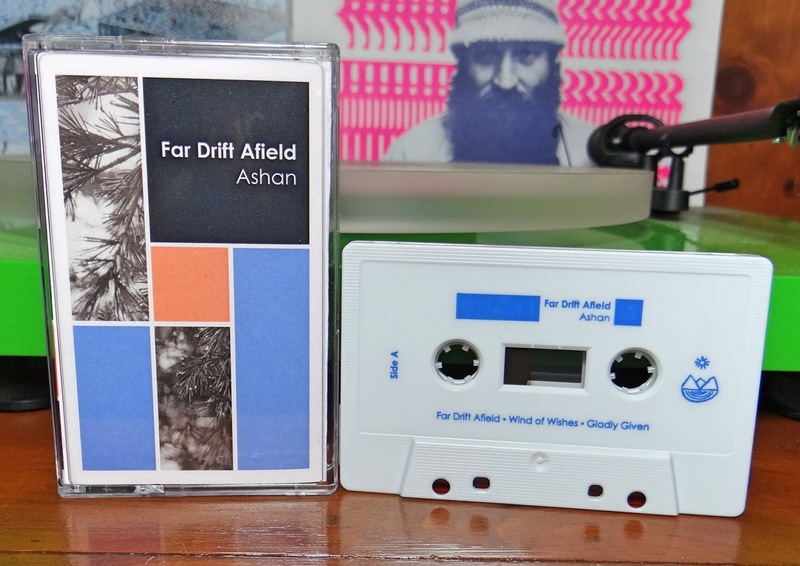 Ashan creates these musical flows in a form of Gaussian distribution, a bell curve pattern with the ends being the cyclic bridge between corporeal and spiritual. 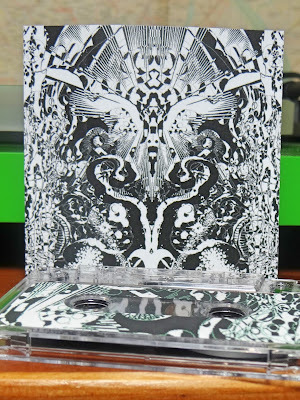 The last tracks on both sides, "Gladly Given and Long Along Sky", are more heavy weighted drone outpourings. A balance to the ethereal beginnings, the nights to sparkling sun drenched days. Stepping back a little and looking at Far Drift Afield as a composition not divided by the flip of a cassette, everything really builds to the last and longest track "Long Along Sky". An aural complement to understanding the vastness of both the spiritual and physical bisects. Be sure to give this an uninterrupted listen. Far Drift Afield is the first composition for Ashan this year. With many previous releases on Inner Islands, this cassette is marks a return to the label from four years ago. 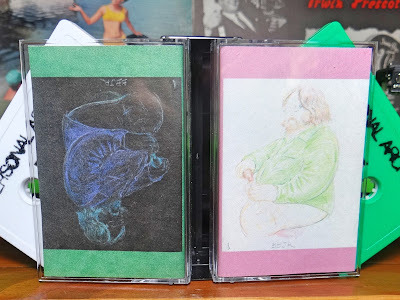 Copies are available from the label's website. 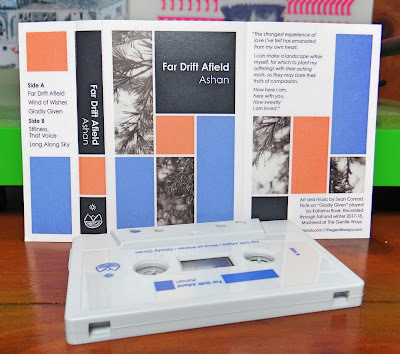 Check out the Ashan bandcamp page if you want to dive deeper into previous releases. This one was just released on the last day of July.